Was just talking with our software dev about the squished buttons. Seems like it had something to do with the CSS code used to create the keypad...however, when I went to show him the error on my tablet it was fixed....I thought about it for a while and realized that I'd put the tablet on our office wifi...it went online and downloaded updates for chrome...which fixed the problem. This model of tablet has been around for a while and the version of chrome that comes on the tablet might be as much as 3 years old by my guess. It seems likely to me that if you get your tablet online and let chrome update, your interface issue should be resolved. Thanks again for bringing this to our attention. I'll be adding "chrome update" to my list of pre-ship checks! I have attached an image of the update in the Handibot FINAL CHECK! Can you be more specific where to find these settings. I have opened up the Configuration button and found the Chordal Tolerance in General Tab. Is the XYZ Jerk settings in the Axes Tab? If so are you referring to Maximum Jerk (not me I hope)? If that is true mine was already set to 25. Also is this the latest CURRENT UPDATE NEEDS? Chordal tolerance setting is found on the first page of the configuration menu (the little gear icon on your dashboard). Jerk settings are found in the "axes" tab in the configuration menu. They are set individually for all axes. 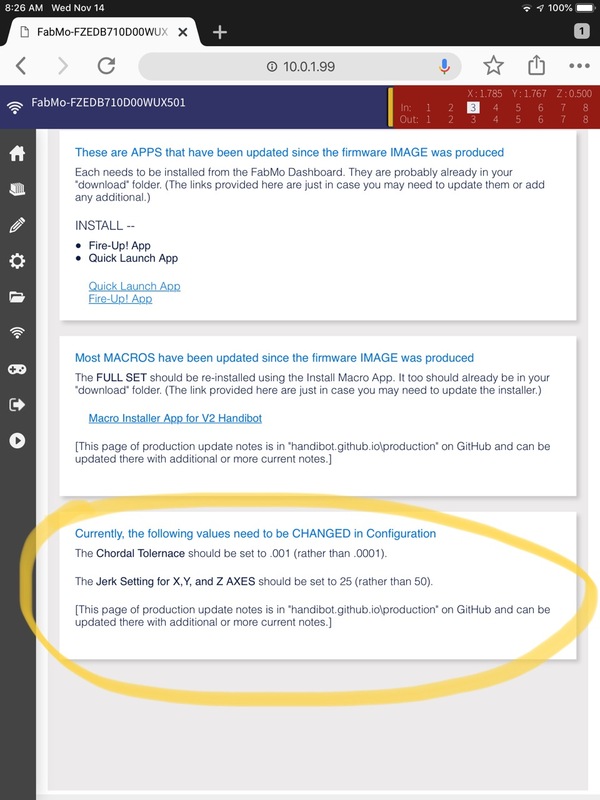 Those notes in the "final check app" may refer to things that have already been permanently fixed in the shipped version of the software. The final check app is a collection of tests that I perform on tools before they leave the factory--initially we had planned to delete it before shipping; but I've always found the tests to be a helpful diagnostic tool for customers calling in with motion or cutting issues, so I leave it on there.